Dating the Ban Chiang cultural tradition has been the subject of controversy and scholarly debate for more than forty years. The excavations in 1974 and 1975 showed that the site had a long stratigraphy and was occupied for thousands of years (Gorman 1976). In the early 1970s, thermoluminescence dates on unprovenienced ceramics suggested, incorrectly, that the striking red-on-buff pottery that had first brought Ban Chiang fame was more than 6000 years old. However, we know now that this pottery dates to the Late Period (300 B.C.-A.D. 300). The first radiocarbon dates on charcoal suggested that the black incised and impressed pottery from the Early Period may have dated to about 3600 B.C. (Gorman 1976). The date for the earliest black incised pottery has been revised to about 2100 B.C. based on radiocarbon dating of rice remains from inside one of the lowest pots excavated by Penn/FAD (White 2008). 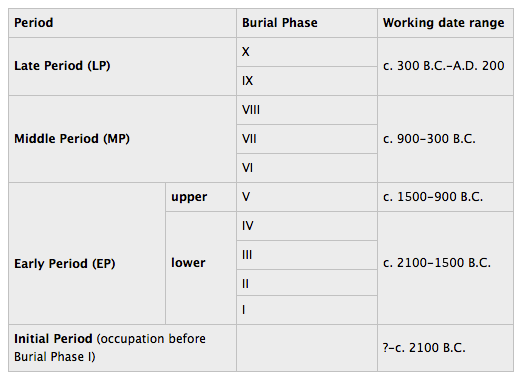 Most recently a new series of dates from bone have been proposed to radically revise the Ban Chiang chronology (Higham et al. 2015). However, these new dates are out of sync with other regional evidence and may have technical flaws (White 2015). The scholarly debate on Ban Chiang dating shows no end in sight. Left: BCES 1241 Pot A (black incised and impressed pottery). 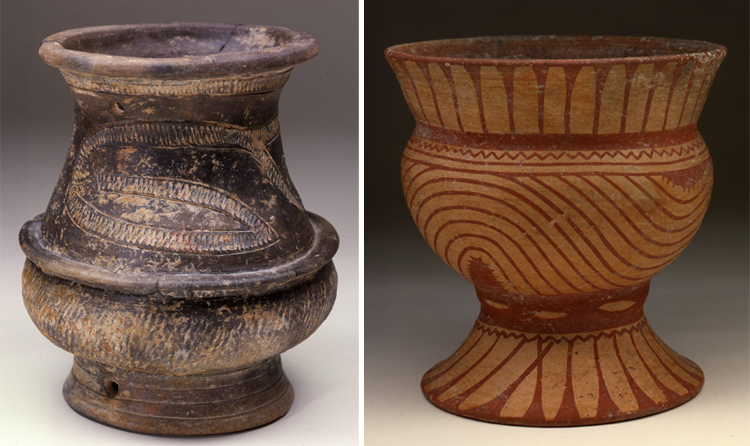 Right: BCES 1390 Pot B (red-on-buff pottery). 1976 Ban Chiang: a mosaic of impressions from the first two years. Expedition 18(4):14-26. 1986 A revision of the chronology of Ban Chiang and its implications for the prehistory of northeast Thailand. Ph.D. dissertation, University of Pennsylvania. 1997 A brief note on new dates for the Ban Chiang cultural tradition. Bulletin of the Indo-Pacific Prehistory Association 16:103-106. 2008 Dating early bronze at Ban Chiang, Thailand. In From Homo erectus to the Living Traditions: Choice of Papers from the 11th International Conference of the European Association of Southeast Asian Archaeologists, Bougon, 25th-29th September 2006, edited by J.-P. Pautreau, A.-S. Coupey, V. Zeitoun, and E. Rambault, pp. 91-104. The 11th International Conference of the European Association of Southeast Asian Archaeologists, printed in Thailand. 2015 A new chronology for the Bronze Age of northeastern Thailand and its implications for Southeast Asian prehistory. PLoS ONE 10(9): e0137542.doi: 10.1371/journal.pone.0137542.